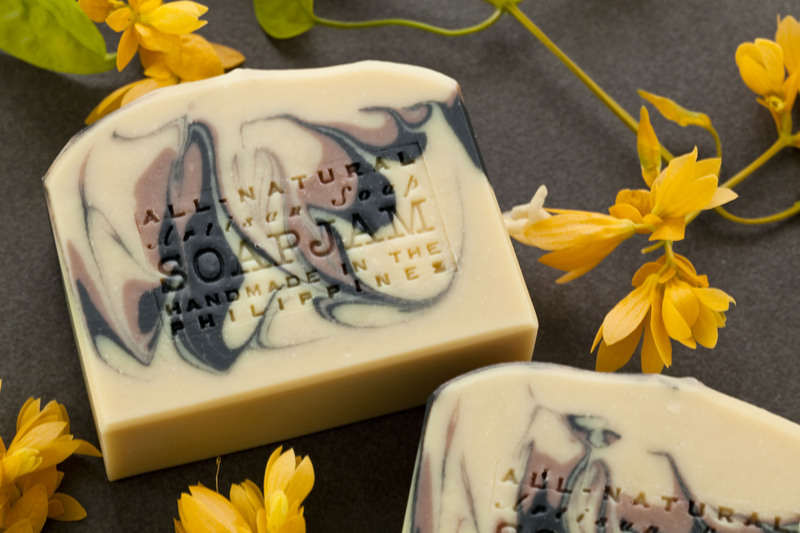 As much as I enjoy making soaps with fragrance oils and pigments, my first and true love has always been natural, therapeutic soaps. 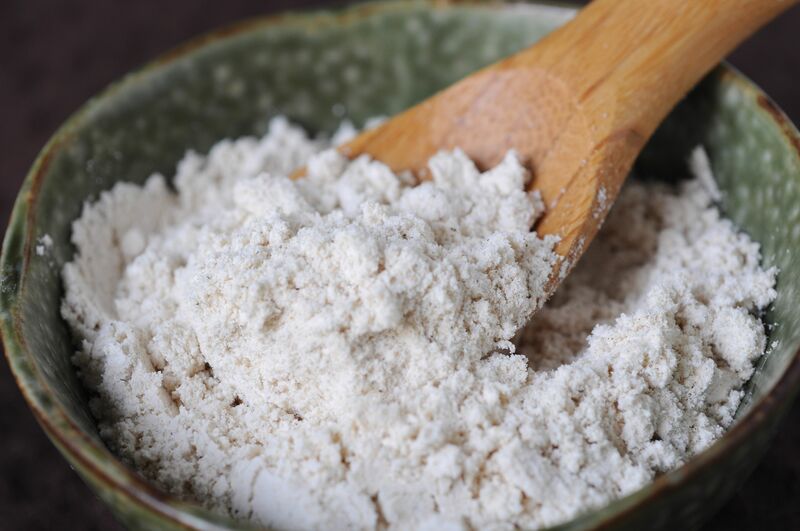 I get really excited discovering and experimenting with new ingredients that may offer any kind of skin benefit. I have been soaping like crazy since I came back from Taipei two weeks ago. 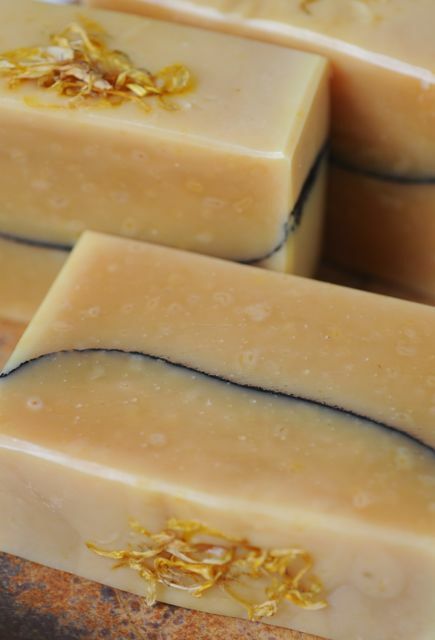 I made mostly fragrance oil-scented soaps, but I managed to make two all-natural ones using some of the ingredients I stuffed my suitcase with. With so many choices, it was hard to pick which ingredient to use first. 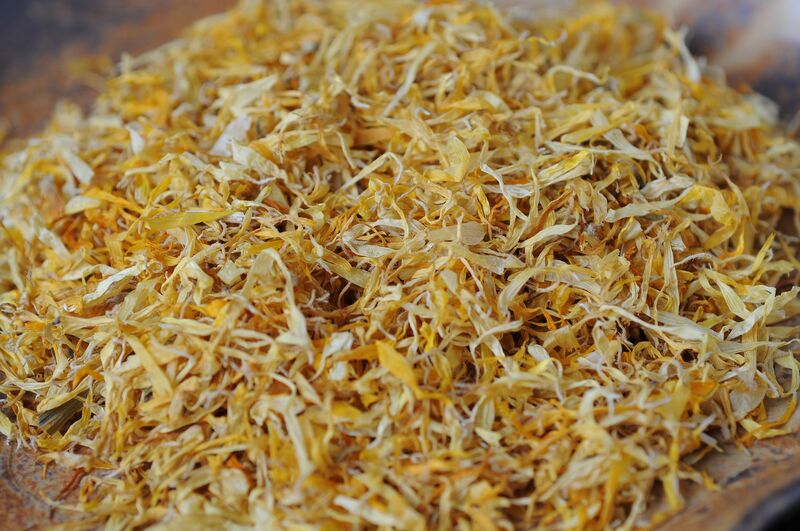 I finally settled on calendula, a very popular herb among soap makers, but it was my first time to use it. Instead of steeping the petals in oil, I made a concentrated tea and let it steep overnight. Since we don’t have calendula in the Philippines (maybe we do, but I am not aware of it), I didn’t want to throw away the petals. I wanted to use everything so I separated most of the liquid and proceeded to blitz the remaining calendula with reconstituted goat’s milk powder. I mixed all the liquid with the blended petals into my oils – coconut, olive, palm, rice bran and cocoa butter – before adding my master-batched 50% lye solution. To intensify the yellow color, I used 2 parts blood orange e.o. and 1 part litsea cubeba, totalling 4.2% of my oils. Next time I will increase the essential oils to at least 5% because at 4.2%, the scent is barely there. I wanted to add some interest so I tried doing a pencil line for the first time. I really like the effect but I think I was a bit heavy handed with the activated charcoal. I still have some lard that I carefully rendered with salt and water a few months ago. I plan to just finish what I have and no longer use it in the future. It is just too tedious to make and I don’t think it would appeal to people even though it makes for a gentle and hard bar of soap. 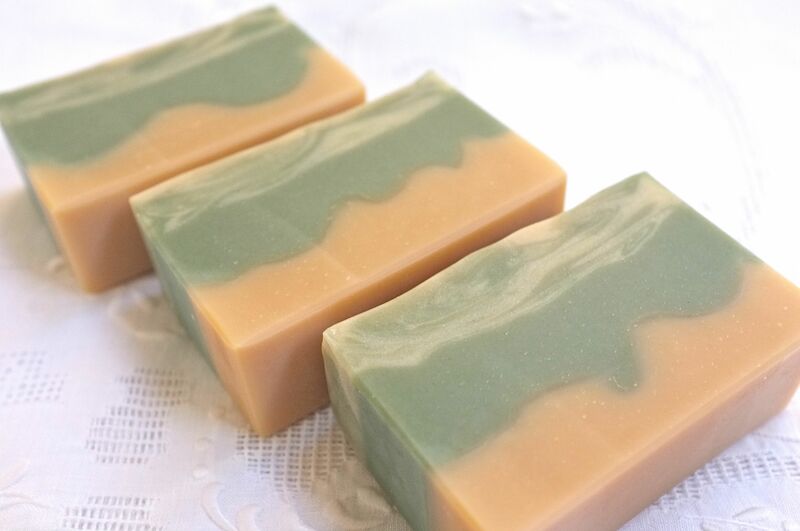 I needed the extra hardness for the facial soap I had in mind, so I incorporated a little bit of lard into my recipe containing coconut, olive, avocado, rice bran, pili and castor oils. I also added 2% salt and 1.5% sodium lactate, less than what I used for my Charcoal Neem Soap. 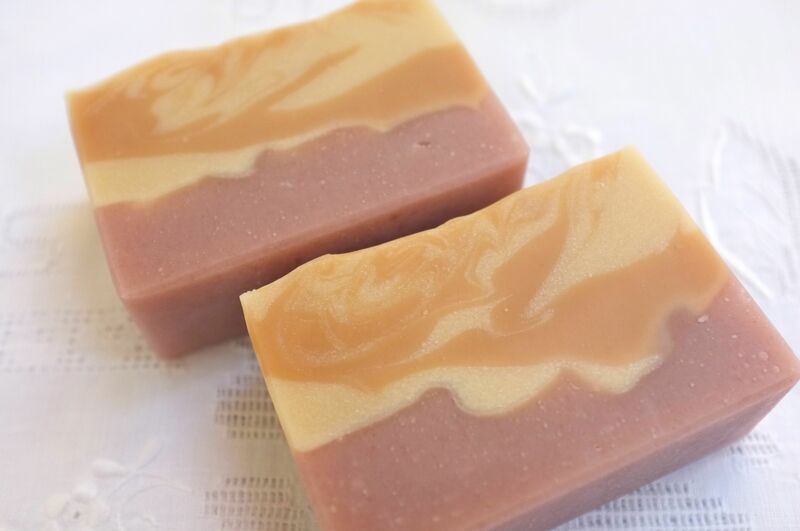 For a richer and creamier soap, I used coconut cream, and to keep it all natural, I used essential oils of blood orange, rosemary and tea tree. 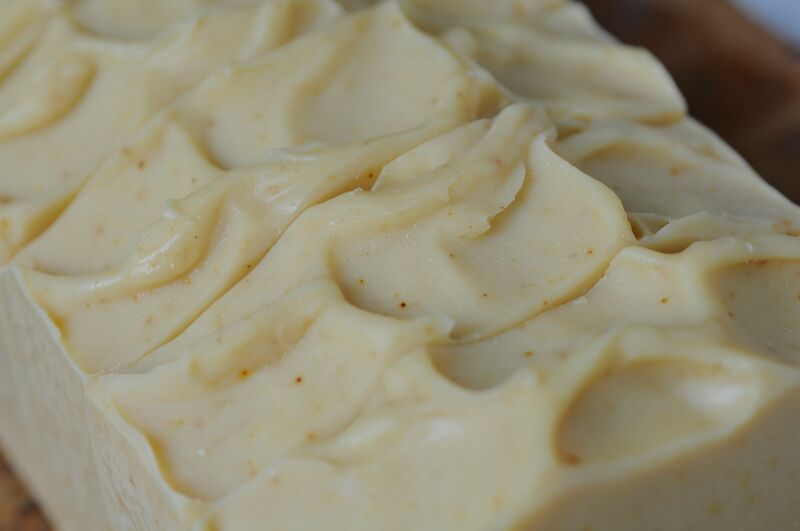 I mixed the essential oils with Job’s Tears powder along with kaolin clay and turmeric powder to anchor the scent, before adding everything into the soap batter at light trace. 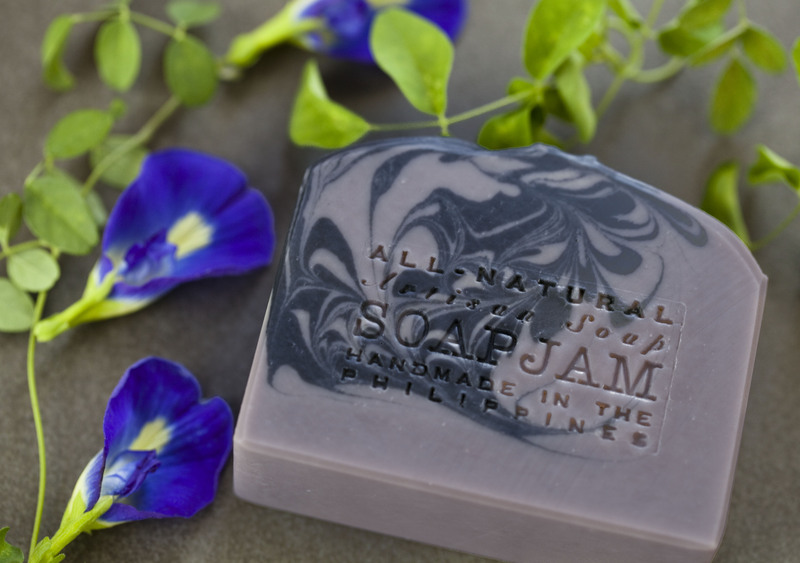 I love that the soap is completely ash-free and the texture is so smooth and creamy. I think the powders, partly acting as anchors for the essential oils, worked, because I could smell the blood orange amidst the strong tea tree. I hope the scent stays after cure! 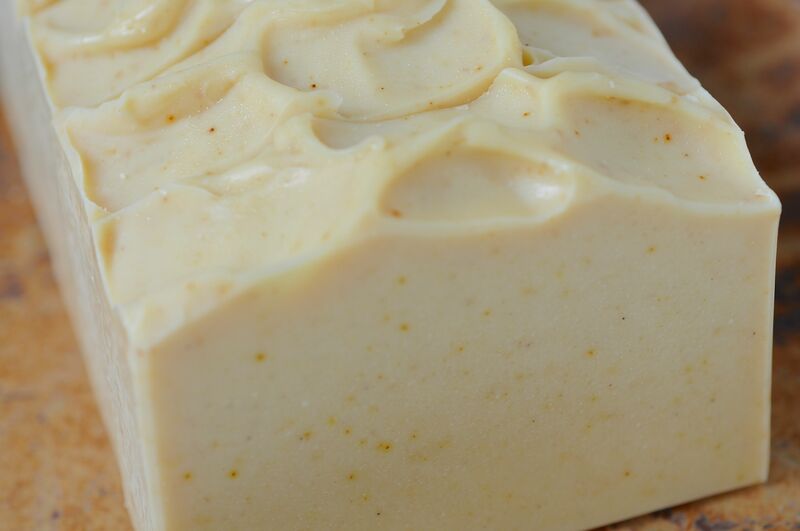 This entry was posted in All-Natural, Cold Process and tagged blood orange, calendula, coconut cream, Essential oil, Goat's Milk, Job's tears, Kaolin clay, Lard, Rosemary, Taipei, tea tree, turmeric on November 1, 2013 by soapjam. 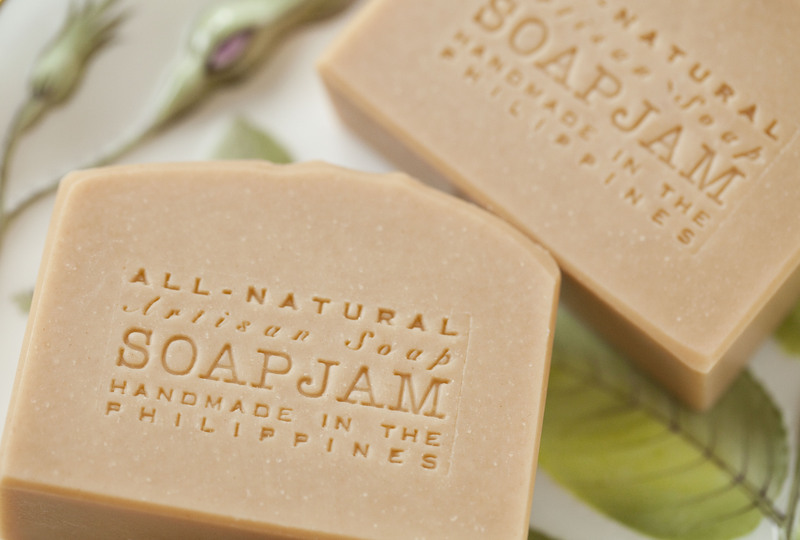 When I started making soap, I thought I would never go into the sweet and fruity direction. Citruses yes, but not the whole fruit basket and bakery scents. 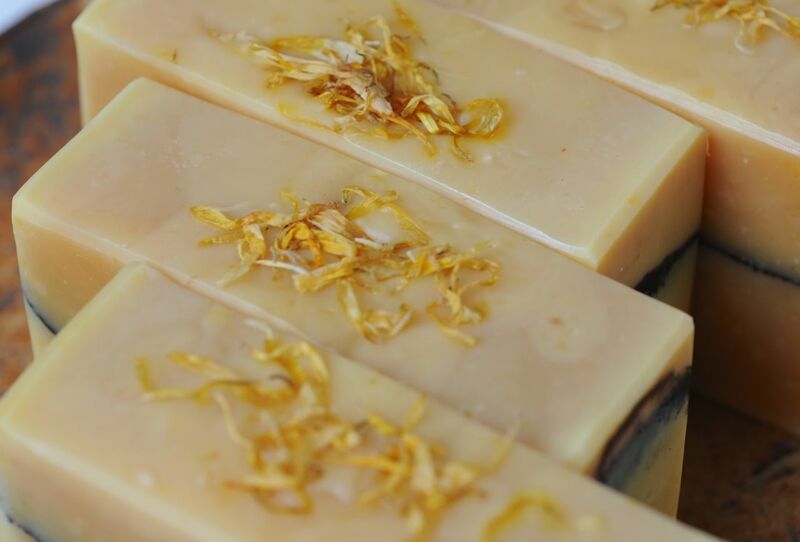 But with the numerous delicious looking and sounding soaps that I see in other people’s blogs, I found myself slowly getting lured into this realm. It does not help either that I got addicted to shopping for scents! Before I got sick earlier this week, I made 5 batches of soap last Sunday and another 2 on Monday, using new fragrances. I thought they all smelled great and I just kept on sniffing them whenever I had the chance. But when I got sick, I was totally repulsed by the smells, most especially Monday’s 2 carrot batches scented with cranberry marmalade and orange peel/kumquat. It appears to be that I got some kind of stomach flu which is going around. I am much better now and I can’t wait to be able to fully enjoy my fragrances again! I was able to take pictures of the soaps from last Sunday, but not the ones from last Monday. I don’t know when I can bring myself to go near them to take photos because even from afar, I smell them. Everywhere! The spatulas, containers, notebook! So here are the 5 that I was able to photograph. If they appear hazy, it’s because I accidentally turned on a filter feature which my husband found out after I took the photos, and I just didn’t have the inclination to do a retake. 1. Orange Raspberry Sherbet – made with coconut, olive, palm and avocado oils with powdered goat’s milk, and scented with wild raspberry and tangerine f.o.’s. I really like the fresh, tart scent. It reminds me of childhood summers spent with cousins eating Baskin Robbins’ orange sherbet. I wanted to do a Celine swirl but right after I added the raspberry f.o., the soap was setting up fast so I had to ditch my original plans. 2. 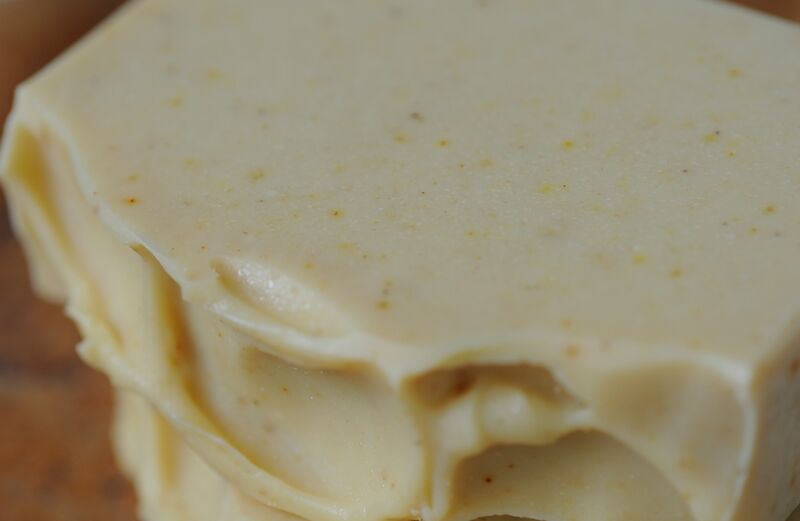 Pear Almond Tart – This and the succeeding soaps below are all yogurt soaps with coconut oil, olive oil, palm oil, rice bran oil, and cocoa butter. The smell reminds me of a pear frangipane tart that I make and love. The bottom part is scented with an almond pastry fragrance, and the top part with bartlett pear. 3. 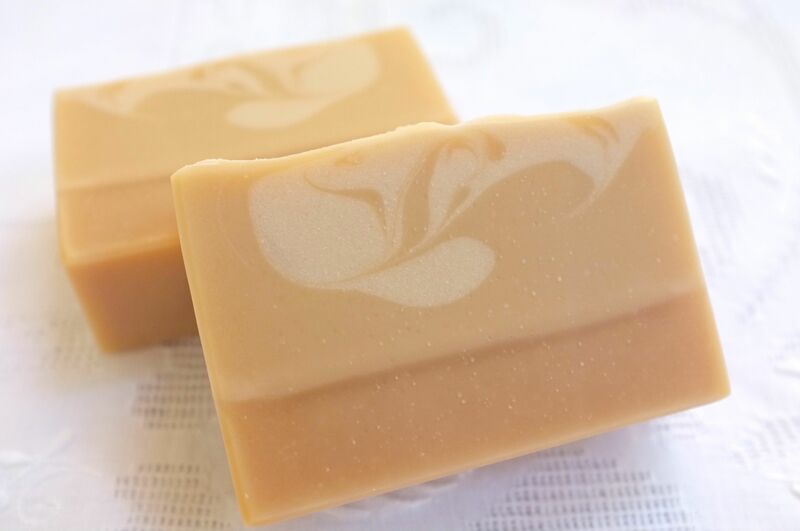 Apple Almond Tart – scented with tart apple and almond pastry fragrances, this smells strong! I think I will like it better when it has mellowed out. I’ve noticed that yogurt warps certain colours like blue, but I didn’t feel that it did with green chrome oxide. However, this one turned bluish green, so it must be the tart apple fragrance. 4. 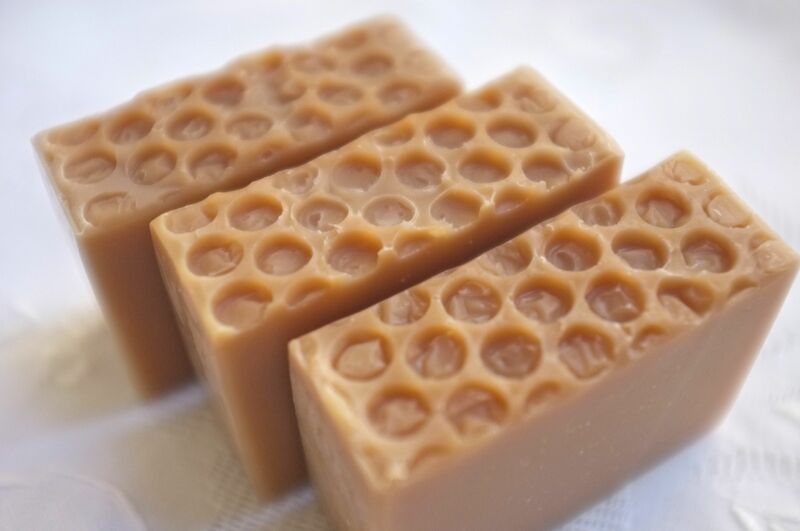 Honey Bee – I finally got to use the bubble wrap design for my honey soap! This is certainly one of my favourites! 5. 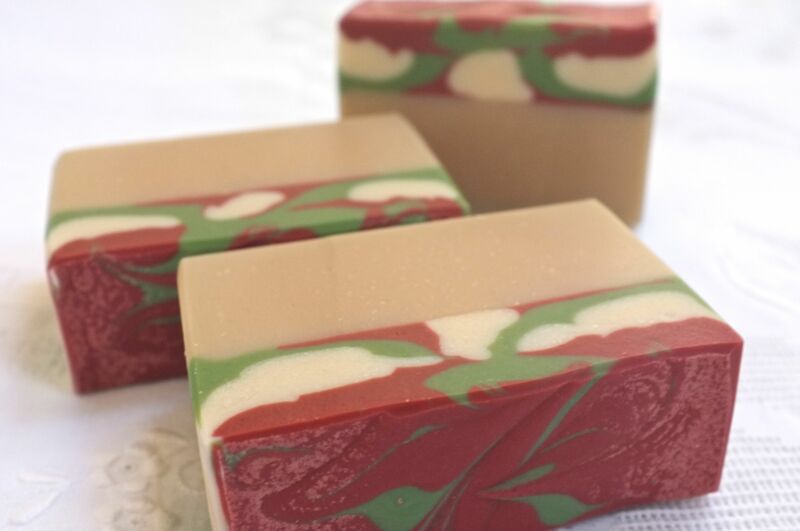 Peppermint Vanilla Noel – It’s the first time I’ve achieved rich vibrant colors and I couldn’t be more thrilled! I used brick red and green chrome oxides, using a scant 1/4 teaspoon per cup of soap batter following Amy Warden’s colouring guidelines. Of the 5 batches, my husband and I like this scent the best. The red, green and white top is scented with peppermint e.o., and the bottom part, which I left uncoloured thinking it would turn a darker brown, is scented with sweet smelling vanilla noel. This really smells like candy canes! With this soap, I learned it is not a good thing to pre-empt soda ash. Originally there was much less soda ash than what you see in the photo. It was really just a slight sprinkling, so I thought I would arrest its development by steaming it. It became worse instead! I will have to observe if the soda ash thickens, and I will steam it again. 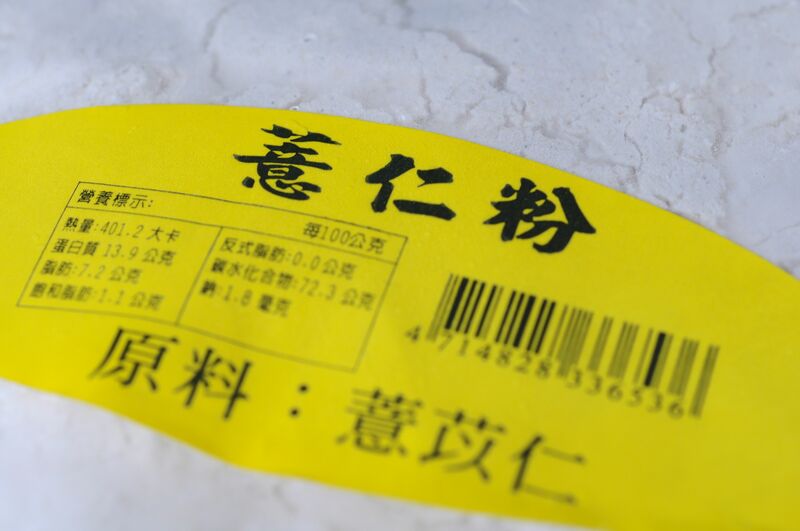 This entry was posted in Cold Process, Perfumed Soap and tagged Goat's Milk, Honey, Yogurt on September 29, 2013 by soapjam.